"The Washington Post reported on Nov. 2 that the CIA has been hiding and interrogating some of its most important al Qaeda captives at a Soviet-era compound in Eastern Europe as part of a covert prison system that at various times has included sites in eight countries, including Thailand, Afghanistan and several democracies in Eastern Europe. The Post did not identify the Eastern European countries at the request of senior U.S. officials, who said the disclosure could disrupt counterterrorism efforts in those countries and elsewhere and make them targets of retaliation." "Rice's tour of Europe has been dogged by questions concerning the treatment of prisoners at secret CIA prisons. She issued a detailed statement on U.S. policy before she left for Europe on Monday, intending to dampen the furor, but there has been confusion in the United States and Europe over its precise meaning." Poland is one of these countries and the story has been covered well by Beatroot. The United Kingdom is another, which makes Foreign Secretary Jack Straw's request for US "clarifaction" silly. Can one honestly think for a moment that the US intelligence agencies are not working in concert with their European counterparts in a fight against terrorism? Only the most die-hard liberal would think the US is running its own clandestine prisons on European soil without the host government's knowledge. "One of Europe's moral conceits is to fret constantly about the looming outbreak of fascism in America, even though it is on the Continent itself where the dictators seem to pop up every couple of decades. 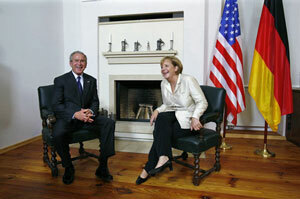 Then Europe dials 9-11, and Washington dutifully rides to the rescue. The last time was just a few years ago, as U.S. firepower stopped Slobodan Milosevic, who had bedeviled Europe for years. In return, it would be nice if once in a while Europe decided to help America with its security problem, especially since Islamic terrorism is also Europe's security problem. But instead the U.S. Secretary of State has to put up with lectures about the phony issue of 'secret' prisons housing terrorists who killed 3,000 Americans. We put 'secret' in quotes because the CIA could hardly carry on operations in Europe without the knowledge of the countries involved. Rather, as Ms. Rice dryly put it, the U.S. often engages "the enemy through the cooperation of our intelligence services with their foreign counterparts." So the so-called "rendition" programs at issue -- involving the transportation, detention and questioning of terror suspects -- are precisely the kind of anti-terror efforts that multilateral Europeans ought to love." Europe is a relativist, post-Christian (post believing in good-evil), society. Along with this moral relativism coincides a collection of governments who have abdicated their ability to project military power and defend their interests abroad. However, their ability to hold press conferences and badger the US on human rights and torture, aside from being laughably disengenious, is about all that Europe can muster. On trade, security, immigration, terrorism and economic growth, the Europeans have proven, over the past decade, an impotent lot. Carping on a Ms. Rice matches the dignity of the position of strength Europeans now find themselves in. Dawn's Early Light has advocated often why Europe matters. It is stories like this that give me second thoughts. The Washington Times reports on an important US initiative in the Sahel region of North Africa. The United States is spending $100 million a year for five years ($500 million total program) by funding the Trans-Saharan Counter-Terrorism Initiative (TSCTI). The Saleh region covers nine nations and has approximately 65 million people. "Algeria, Chad, Mali, Mauritania, Niger, Senegal, Morocco, Nigeria and Tunisia take part in the TSCTI. During the first phase of the program, dubbed Operation Flintlock, U.S. Special Forces led 3,000 ill-equipped Saharan troops in tactical exercises designed to better coordinate security along porous borders and beef up patrols in ungoverned territories. Maj. Silkman said Africa has become the most important concern of the U.S. European Command (Eucom) because of rampant corruption, drug and human trafficking, poverty and high unemployment, which create a significant 'potential for instability,' particularly in the Saharan region, where 50 percent of the population is younger than 15. The TSCTI is 'one of the franchises' to defeat ideological entrepreneurs trying to gain a foothold by reaching out to the 'disaffected, disenfranchised, or just misinformed and disillusioned,' she said." Al-Qaeda may be looking to partner with other militant African groups like the Salafist Group for Preaching and Combat (GSPC) that is believed responsible for the attack on European tourists in 2003 and may have as many as 300 terrorists in the network. There is an additional concern because some estimates place 25% of Iraqi suicide bombers from North Africa. There is some skepticism in some of the North African nations about the TSCTI plan. Some Africans view the plan as a US move to gain more influence over African oil. Others argue that repressive governments are using the US Global War on Terror to deny civil rights to their citizens. Department of the Treasury, 'efforts to tighten up money-handling controls in the region'"
This area falls within the Combined Joint Task Force-Horn of Africa's (CJTF-HOA) [See DEL post here regarding] area of responsibility [CORRECTED July 10, 2006, thanks to reader Mark S. This area doesn't fall under the CJTF-HOA]. The US has already spent $112 million in food aid for the region (for a list of USAID projects see here). "help strengthen regional counterterrorism capabilities, enhance and institutionalize cooperation among the region’s security forces, promote democratic governance, and ultimately benefit our bilateral relationships with each of these states. Key aspects of the TSCTI training would include basic marksmanship, planning, communications, land navigation, patrolling and medical care." "US military members arrived throughout North and West Africa to participate in exercise Flintlock 2005. Flintlock, which ran June 6-26, was a series of military exercises conducted with US theater security cooperation partners in Africa. European and the NATO partner nations also participated, either directly or in an advisory role. The principal purpose of this training was to ensure all nations continue developing their partnerships; further enhance their capabilities to halt the flow of illicit weapons, goods and human trafficking in the region; and prevent terrorists from establishing sanctuary in remote areas. The training took place in several countries: Algeria, Senegal, Mauritania, Mali, Niger and Chad. Participants practiced a wide variety of skills to include airborne operations, small-unit tactics, security operations, land navigation, marksmanship, medical skills, human rights training and land warfare." Much like CJTF-HOA efforts in the Horn of Africa, the TSCTI seeks an approach to dealing with failing states on a multi-tier level. Improving command and control, military training, food aid, education and other human assistance areas are the joint approach the US is taking with North African participants. Securing a safe North Africa will be at a minimum a generational task. However, it is a long term commitment the US cannot afford to neglect. North Africa could become another Taliban led Afghanistan or haven for terrorism and a prime source of potential recruits. TSCTI is a good further step along the road to changing and improving the North Africa region. "IGC Report on the Sahel Region", Winds of Change, April 11, 2005. - This is an exhaustive analysis of the threats in the Sahel by Dan Darling. "Diplomatic Murders and the Sahel", The Fourth Rail, July 28, 2005 - A great piece on the link between the Sahel region and Al-Qaeda in Iraq. 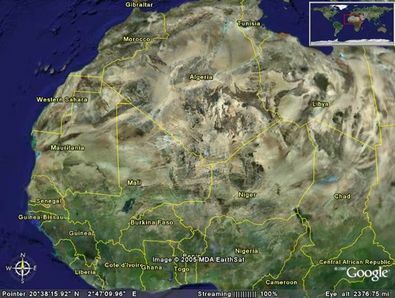 "WOT: Overlooked but Interesting..." Winds of Change, October 20, 2004 - Another good piece by Dan Darling on the Sahel region. "New Counterterrorism Initiative to Focus on Saharan Africa", American Forces Press Services, May 15, 2005. "Her primary goal, it would appear, is to support the legitimacy of the current elected government while encouraging the Kurds and Shiites to be as inclusive as possible with the Sunnis. Her visit serves two other purposes as well: to remove the spotlight from the recent bombings and refocus world attention on building a democratic Iraq, thereby reducing the media influence of the militants, and to buttress work being done on an acceptable constitution." "'We do support the principles of democracy and support efforts to bridge the differences among Iraqis,' Rice said following a meeting with Iraqi Prime Minister Ibrahim al-Jaafari. Divisions 'may be differences of history or tradition, culture or ethnicity, but in a democratic process these differences can be a strength rather than a handicap,'' she said." To encourage democracy in the Middle East, the State Department has two initiatives. "[I am] very much looking forward to going to the Forum for the Future in Bahrain. We are going to establish the first two institutions of the Broader Middle East Initiative: the Fund for the Future, which will be a set of equity investments in small businesses and medium size businesses to try and help stimulate private economic development. It is a fund that is anticipated to be at about $100 million. We will also establish the Foundation for the Future, and that foundation will make grants -- it's anticipated to be about a little over $50 million -- anticipated to make grants to democracy organizations, NGOs in the region that want to promote equality for women, that want to promote the development of political parties and free press, and so forth. And the remarkable thing about this is that we're going to have Arab partners, Middle Eastern partners, in both of these ventures. And so I'm very much looking forward to that." The dollar amounts however are small, but they are a start. It will have to be Iraq as a model of democracy that, over time, will inspire change in the Middle East. That is why winning the war in Iraq is a critical piece in spreading liberty and democracy and reducing instability and the threat of terrorism. Note to Brazil and India: Blame France! "America can currently spend up to $19.1 billion on farm-production subsidies, which heavily distort trade. The EU can spend over $75 billion. Robert Portman, America's trade representative, offered to cut his country's limit by 60%, if the EU agreed to cut its permitted subsidies by 80%. Mr Portman also suggested limiting other subsidies, which do not distort trade as heavily, to 2.5% of the value of agricultural production. These two limits provide plenty of scope for creative accounting. Even as America lowers the ceiling on the most trade-distorting subsidies, some of this money will be reclassified as something else. To the big agricultural exporters, such as Brazil, handouts to rich-world farmers, however galling, matter less than access to rich-world consumers. The trade powers appear to have settled on how to cut farm tariffs, if not by how much. Following a scheme outlined in July, tariffs will be divided into four “tiers”, according to their height. Those in the top tiers will be cut by more than those in the bottom. This week, Mr Portman proposed that rich countries should cut any tariff over 60% by as much as 90%, and any under 20% by more than half. No rich country should impose a tariff above 75%, he said." This proposal woke up the trade negotiations and required a global response. The US approach definitely supports a more liberal economic view of trade, and it is encouraging to see the US champion an approach that can help the developing world improve its economic lot while making a major American concession. It is common knowledge that the US, Japan and Europe have massive farm subsidies that are politically dear to the governments in power. These subsidies greatly distort the ability of the developing nations to compete with their crops. Additionally, it applies negative pressure on developing nation farmers as they cannot make their farms profitable, which, of course, does not benefit the developing nations. The US, Japan and Europe then provide large subsidies, loans and grants to the developing world in attempting to move them out of their economically poor condition. DEL understands this is a simplified argument and that it doesn't take into account other large inefficiencies in the developing world, like corruption and other policies and practices that keep the poorest people from rising out of their predicament. Brazil and India have much to gain by seeing the US proposal advanced. This left first the potential for Japanese obstruction. 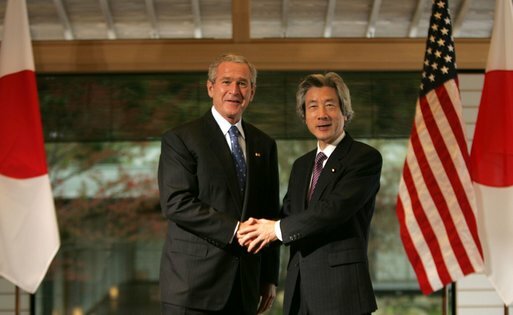 But given Koizumi's September electoral victory, which depended far more on urban support than rural support, it is likely that Japan can find some room for compromise. "The EU said its offer would cut European farm tariffs by an average of 46 per cent and reduce its highest tariffs by 60 per cent, against the 50 per cent cut tabled earlier this month. The US criticised in particular the EU's continued demand to maintain steeper tariffs on 8 per cent of its 'sensitive' imports. The US and others have called on the EU to reduce the list of sensitive products to only 1 per cent of the total and have also set 54 per cent as the minimum average tariff cut that the EU should offer." "'It is totally out of the question for us to go a single step further,' Chirac told a news conference after the EU's informal summit at Hampton Court Palace, near London today. France would have a veto over any agreement, he added." For background and analysis on Chirac and EU trade negotiator Mandelson's political maneuvers with each other, see this Financial Times piece. So the EU response yesterday was to table the entire agriculture portion of the debate and move directly towards industry and services, an area of concern more to the developed world and less to the developing world. The European Union, by French veto power, is the stumbling block in making major agriculture trade reform. This apparent arrogance directly impacts Brazilian and Indian farmers and should be a good reminder of where French interests lie: with Chirac's short-term best interests. France's actions are like a spoiled child who has been indulged for far too long. The US, Eastern European farming nations, Brazil and India, along with the African nations, should continue to apply pressure on France to reform its farm policies and rightfully link other issues of international relations to produce change. 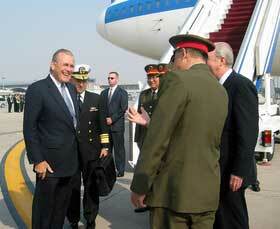 Secretary of Defense Donald Rumsfeld arrives in China today. His words will be very interesting to watch on three key areas: 1) the massive Chinese military buildup, 2) cross strait relations with Taiwan and 3) six party talks with North Korea. "Rumsfeld questioned China's motives in underreporting its defense spending. He mentioned no figures, but the Pentagon said last summer that China may be spending $90 billion on defense this year _ three times the announced total. 'I think it's interesting that other countries wonder why they would be increasing their defense effort at the pace they are and yet not acknowledging it. That is as interesting as the fact that it's increasing at the pace it is.'" "In his remarks to reporters traveling with him from Washington, Rumsfeld said he would not have waited so long to accept China's repeated invitations to visit if not for the April 2001 collision of a Chinese fighter jet and a Navy EP-3 surveillance plane over international waters. The incident infuriated Rumsfeld, who responded by breaking off U.S. military contacts with China for a time." "The Chinese, however, denied Rumsfeld's request to visit the Western Hills command center, an underground facility that serves as a national military command post. No foreigner is believed to have been inside Western Hills. Rumsfeld told reporters on Monday that he was not disappointed that he would not see Western Hills. Of his hosts' decision not to permit the visit, he said, "'It tells something about them.'" Rumsfeld will be meeting with Chinese President Hu Jintao and on Wednesday will meet with Gen. Cao Gangchuan and give an address to a Chinese Communist think tank that was formerly run by President Hu. "Chinese Foreign Ministry spokesman Kong Quan said Tuesday that China is firmly opposed to all kinds of military exchanges between the United State and Taiwan. The Chinese government is also firmly opposed to any form of US-Taiwan military cooperation including US arms sales to Taiwan, Kong said. Replying to questions concerning the visit of US Defense Secretary Donald Rumsfeld, Kong said that the Taiwan issue is the core in the overall Sino-US relations." "The Chinese People’s Liberation Army (PLA) is modernizing its forces, emphasizing preparations to fight and win short-duration, high-intensity conflicts along China’s periphery. PLA modernization has accelerated since the mid-to-late 1990s in response to central leadership demands to develop military options for Taiwan scenarios. In the short term, the PRC appears focused on preventing Taiwan independence or trying to compel Taiwan to negotiate a settlement on Beijing’s terms. A second set of objectives includes building counters to third-party, including potential U.S., intervention in cross-Strait crises. PLA preparations, including an expanding force of ballistic missiles (long-range and short-range), cruise missiles, submarines, advanced aircraft, and other modern systems, come against the background of a policy toward Taiwan that espouses 'peaceful reunification.' China has not renounced the use of force, however. Over the long term, if current trends persist, PLA capabilities could pose a credible threat to other modern militaries operating in the region." "He expressed hope that China will lend its influence and military capability to other constructive efforts as well. 'Certainly we are looking for ways that we can cooperate to a greater extent in the war on terror and other common interests,' he said. China is already showing strong indications of that cooperation. 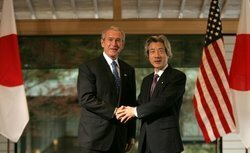 Immediately following the Sept. 11, 2001, terrorist attacks against the United States, China offered strong public support for the war on terror and has since been an important partner in U.S. counterterrorism efforts. China supported U.N. Security Council Resolution 1373, publicly supporting steps to combat international terrorism. It also contributed $150 million of bilateral assistance to Afghan reconstruction following the Taliban's defeat. China also pledged $25 million for Iraq's reconstruction." While his phrasing will be clear and direct, likely as usual, what the Chinese say and how they say it may be a better indicator of where US-Sino relations are heading. Update: The UPI is reporting that China announced prior to Sec. Rumsfeld's visit a "white paper" on the "Building of Political Democracy in China". This white paper seems focused on grass roots areas of democracy, most probably a city-council style approach to democracy for rural and possibly urban areas. Update 2: tdaxp has a post about the American Arleigh Burke class destroyer, the USS Curtis Wilbur (DDG 54) performing a goodwill visit in China that overlaps Sec. Rumsfeld's visit. Survey Intro - "Democratic Peace"
There is no greater challenge to American security and ensuring the advancement of individual liberties than winning the War on Terror. Like the Cold War, the Greater War on Terror will be at least a "generational" struggle. The ultimate end to the war cannot come by negotiation, treaty or unilateral withdrawal from the field of battle. Victory can only be achieved through the advancement of democratic principles around the world, the ending of regimes that support and supply terrorists, and the encouragement of liberty in every part of the globe. This belief in "Democratic Peace" or the notion that democratic nations do not war against one another and have far more stable relations has a long-proven record of empirical success. This author strongly believes that free people around the world can safeguard and defend their own freedom by advancing freedom for others. Based on this premise, I will engage with you, the readers, in a multi-part series on regional and global perspectives on how best to spread Democratic Peace. While China and India are not considered the center of gravity in the War on Terror, the two nations combined represent two-fifths of the world's population with dynamic and growing economies in the heart of Asia. One of these two nations will become a regional hegemon within the next 20 years or so. While similar in many respects, their systems of government represent two conflicting styles: communist rule, and a British-based democratic system. How US foreign policy evolves with both nations and how they interact with each other and their neighbors will be a significant factor in ensuring security in the future. India is a diverse democracy with over 216 different languages, 4 major religions, and a growing economy. The United States is the number one market for Indian companies, capturing 21.2% of total trade, followed by China in second position with only 6.6% of total trade, while the US is the largest exporter to India [Source Economist]. India's GDP per capita is US$3,040 (Purchasing Power Parity "PPP"). The population of 1.1 billion is growing at a 1.5% rate. Based on this rate of growth compared to China (see below), India will overtake China in population within approximately 20 years, when both countries have roughly 1.5 billion people. China too is a diverse country, with a growing capitalist class and nationalist tendencies, especially concerning Taiwan and islands in the Pacific, with a centralized communist system of government. China's GDP per capita is US$5,811(PPP) and has grown at a faster rate than its Indian neighbor. The population of 1.3 billion is growing at a small 0.7% rate [Source Economist]. Both emerging nations benefit from a healthy educational system and governments focused on economic growth in a global economy. While China has enjoyed greater economic success in the past two decades, Indian reforms are enhancing the country's outlook. Energy is the catalyst for future economic growth, and ensuring its supply is vital to which country will ultimately succeed. This struggle is being witnessed in the CNOOC bid for Unocal and India's desire to build a pipline to Iran. The edge goes to India, due to sharing with the US core democractic values that are a part of the "Democratic Peace" concept. Indian Prime Minister Singh was invited to the US for a first-class reception earlier this month. As a sign of respect and the importance the Administration is placing on the partnership, the President hosted only his fourth black tie formal dinner party, along with honor guard review, and the closest event to a royal reception that a country lacking in royalty could bestow. The massive US diplomatic ovetures towards India [See Sec. Rice's efforts here, here and here] have set in motion a change in the balance of power of Asia. Moving forward on the Next Steps in Strategic Partnership (NSSP) to make India a "21st Century World Power" including civil nuclear energy transfers. A Revitalized U.S.-India Economic Dialogue Covering Trade, Finance, The Environment, And Commerce to promote trade between the democracies. A U.S.-India Energy Dialogue To Strengthen Energy Security And Promote Stable Energy Markets. An Initiative To Enhance Joint Activities In Space Cooperation. A U.S.-India Global Democracy Initiative To Aid Developing Democracies. This is a part of the expanding liberty concept of Democratic Peace. A U.S.-India Disaster Response Initiative. While military sales were not announced, it is still likely that a growing relationship between the US and India will enhance, ultimately, India's robust defense capabilities. This has already been seen on the civil side as India purchased a large order of jetliners from Boeing over a rival and public diplomatic push from Airbus and Jacques Chirac. The US-India partnership, especially if it delivers on the civil nuclear technology while bringing India into an international inspection regime, will go a long way to supplying relatively cheap electricity to a growing industrial economy. India's growth is also being supported by Japan, which is making large investments in their economy, in part to invest in an alternative to a potential Chinese rival. While the US has not publicly committed to supporting India's bid for a UN Security Council seat, the partnership is an important step in supporting an alternative development model in Asia that promotes liberty. The best hope is that India does succeed in economic growth, thereby giving the Chinese people the desire of a free press and representative government, which is denied them by their current political leadership. A stronger India will also be a deterrent to an increasingly nationalistic China. Hopefully, the example of Hong Kong and an emerging Chinese middle class will create the necessary internal pressure to bring about substantive democratic reform. To keep the focus elsewhere, the Chinese leadership has made Taiwan and Japan the domestic and international villains respectively. A powerful India will temper regional aspirations from China. Economic prosperity for the roughly 13% of India's population that is Muslim will be another reason for reform in the Middle East, from Egypt to Lebanon to the Gulf States. With 2.4 billion people, ensuring and encouraging democracy in China and India is vital to securing our long-term freedom and influencing the South Pacific and thereby winning a front on the Global War on Terror.